"Come on, let’s play; let’s not waste a minute of the little time we have together." Twin sisters Gabrielle and Danielle are sad about the passing of their dog Spuds from this life. They are mourning in their room about how empty their daily life feels without him when a mysterious blinding light fills the room. Spuds appears, returning from Heaven to explain to the girls that he and the master of angels were watching how sad the girls were and decided to give them another day with their beloved pet. Vowing not to waste a minute, the dog leads the girls outside to play all the ways that they used to when he was still alive. When the day ends, Spuds needs to return to Heaven, so he bids them a sad farewell as they promise never to forget him or stop loving him no matter what. Losing a pet can be a trying experience for all young children and even for adults, so having a book like this around should help a parent be prepared for when it is important. Combining the love of pet ownership with faith and spirituality, this book can help assure children that lost pets may be gone but do not have to be forgotten. 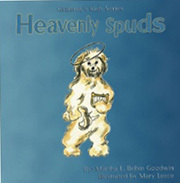 Each page has hand-drawn illustrations featuring the girls or Spuds playing together, bringing rays of joy back into an otherwise sad experience. It can be especially difficult for children to learn to let go of a loved one, but the story this book presents will teach children that though a pet may not be around physically any longer, they can always be a part of their lives in a spiritual sense.